Home - Welcome to the AGH Penguin Swim! About Us - Take the plunge in the Atlantic Ocean for to benefit Atlantic General Hospital on New Year’s Day. 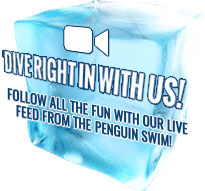 Frequently Asked Questions - Get all the answers about the AGH Penguin Swim in Ocean City, Maryland. Sponsors - Don’t want to take the plunge yourself? No problem, sponsor a team or an individual person that is joining the AGH Penguin Swim this year. Teams - View teams for the 2018 Annual Penguin Swim from Atlantic General Hospital. Watch friends and family plunge into the Atlantic Ocean on New Year’s Day. Gallery - View images of all the Fun of the AGH Penguin Swim. Sign-Up - Sign up as an individual or as a team to take part in this years Ocean City Annual AGH Penguin Swim. Sign up a New Team - Sign up your Penguin Swim Team for the 2018 Annual Ocean City Maryland Penguin Swim benefiting Atlantic General Hospital. Get wet for a good cause! Choose a Team - Choose a Team for the 2018 Penguin Swim Ocean City MD. The 24th Annual Penguin Swim to benefit the Atlantic General Hospital Foundation! Search - Find your favorite Penguin or Team. Donate - You can donate to an individual, a team or just to the AGH Penguin Swim event! Individual Donation - Find your favorite penguin and Donate to them for the 2018 Annual Penguin Swim in Ocean City MD while they jump in the freezing ocean! Team Donation - On Monday, January 1, 2018 at the Princess Royale Oceanfront Hotel your favorite penguins will jump into the ocean! Donate to them right here. General Event Donation - Donate to the 2018 Annual Penguin Swim in Ocean City MD at the Princess Royale Oceanfront Hotel to benefit Atlantic General Hospital! Contact Us - Contact the helpful volunteers of the AGH Penguin Swim.